Well as always we had a difficult time choosing our Ray of Sunshine this week, which is why it is being posted a wee bit late. 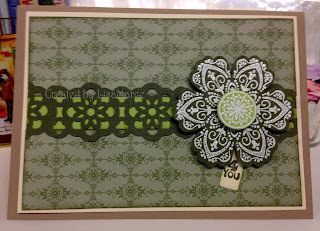 However, our winner this week is this gorgeous card by Lisa. Please take the time to visit her blog and let her know how much you love it. 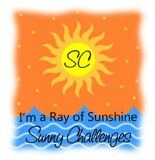 We hope that Lisa will add our badge to her blog. Thanks again to all our entries this week, we truly appreciate your support. Don't forget to check back tomorrow and see what the next challenge will be. Vicky, Gwen, Christine and Kris. Thank you so much for choosing my card as the winner this week, this is the first challenge i have won! And i will proudly display your badge on my blog!! !